President Trump speaks to the March for Life participants via satellite from the Rose Garden of the White House on Friday. Participants at the 2018 March for Life on the National Mall in Washington. Vice President Pence addressed marchers in 2017. Trump said he was "honored" and "proud" to be addressing the march. 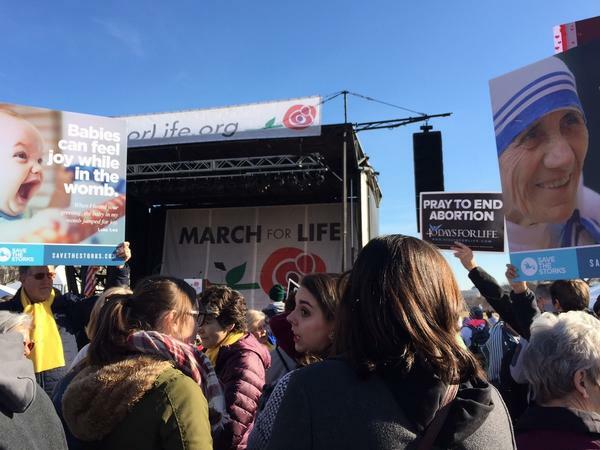 "The March for Life," he said, "is a movement born out of love. You love your families, you love your neighbors, you love our nation and you love every child — born and unborn — because you believe every life is sacred, that every child is a precious gift from God." He praised marchers for offering friendship, mentorship and "life itself" to women in need of support. "Because of you, tens of thousands of Americans have been born and reached their full God-given potential. Because of you," he said. "Under my administration," he continued, "we will always defend the very first right in the Declaration of Independence, and that is the right to life." Introducing the president, Vice President Pence called Trump "the most pro-life president in American history." "My friends, life is winning in America," said Pence, who addressed the rally last year. Ajani Gibson, who is African-American and traveled from New Orleans to attend his 11th March for Life. For him, it wasn't about politics — he didn't want to comment on Trump's appearance and couldn't hear his speech from where he was in the crowd. Many marchers, he said, "marched simply to promote the sanctity of life. We are in a moment in our country where life is at a crisis — be it life in the womb, be it the life of immigrants, be it the African-American male. We have a life crisis happening in our country." A statement from Planned Parenthood ahead of the speech condemned Trump's participation in the rally, noting that abortion has been legal for more than 40 years and saying that Trump and his administration have been "laser-focused on using their power to control women's bodies." Trump's speech will mark the first time in the event's history that a sitting president has addressed the crowd live via video feed, organizers say. Previous Republican presidents, including Ronald Reagan and George W. Bush, have spoken to the marchers by phone. Last year, Pence became the highest-ranking official to speak in person at the march. Despite his history of previously expressing support for abortion rights, Trump carefully courted social conservatives and abortion opponents during his campaign. He nearly took that too far at one point, showing his lack of familiarity with the anti-abortion-rights movement by getting far off message when he told an interviewer that he would support punishing women who seek abortions. Trump quickly walked that back after drawing criticism from people on both sides of the abortion debate. As president, he has continued to align himself with the movement through a series of executive orders, administration appointees and nominations to the courts — most notably the nomination of Supreme Court Justice Neil Gorsuch. Social conservatives have wielded substantial influence over Trump's Department of Health and Human Services. In recent months, abortion-rights advocates have taken the administration to court after multiple efforts by HHS to block undocumented immigrants from obtaining the procedure. Trump's speech comes on the heels of another victory for religious conservatives: the announcement that the HHS Office of Civil Rights is creating a "Conscience and Religious Freedom Division" with the stated goal of protecting the rights of health workers who object to participating in abortions or treating transgender patients. Anti-abortion-rights groups praised the move. Susan B. Anthony List President Marjorie Dannenfelser thanked Trump and called the action "an essential step to protect pro-life nurses" and other health workers. The American Civil Liberties Union, which supports abortion rights, was quick to condemn the administration's action. The ACLU's deputy legal director, Louise Melling, issued a statement accusing the Trump administration of "doubling down on licensing discrimination against women and LGBT people, all in the name of religion." Large groups of anti-abortion activists have been marching in Washington each January since 1974, a year after the Roe v. Wade Supreme Court decision effectively legalized the procedure nationwide. Destiny Herndon-De La Rosa, president and founder of the advocacy group New Wave Feminists, says she will attend the march to offer a different perspective. "Often, the march is stereotyped," says Herndon-De La Rosa, who is traveling from Dallas to participate. "And there's actually a ton of people who come from different backgrounds. A lot of times they don't feel like they have a place in the pro-life movement. This group is nontraditional pro-lifers." While she says she understands why the president was invited to speak to the marchers, Herndon-De La Rosa is not happy about it. "It bothers me personally because I would love to see this become a nonpartisan issue," she says. "To me, this is a human rights issue. And it's not something that should be tied to the GOP or one religious institution. It should be about people who believe that abortion is violence against the weakest and most vulnerable human beings in the human family." This year's march will come just ahead of events this weekend planned to mark the first anniversary of the Women's March. The event, which drew millions of women and their families and friends to Washington, D.C., and other cities around the world the day after Trump's inauguration, was seen as a repudiation of Trump's views on women's rights, racial equality, immigration and other issues. 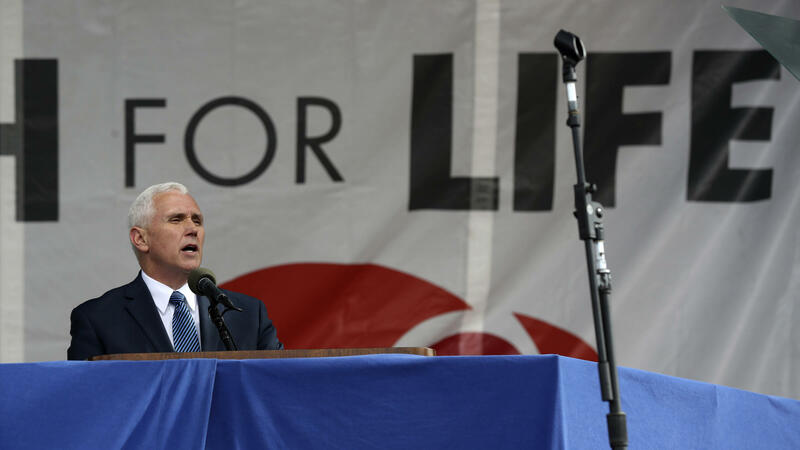 Other speakers at the March for Life include Roman Catholic leaders; Pam Tebow, the mother of former NFL quarterback Tim Tebow, who is known for his conservative Christian beliefs; and several members of Congress who oppose abortion rights, including House Speaker Paul Ryan and Rep. Dan Lipinski, a Democrat from Illinois. Adrienne St. Clair, an NPR National Desk intern, contributed to this report.